Milan attraction-guides.com - Milan, Italy attractions guide Milan Teatro alla Scala (Milan Opera House), Santa Maria information about attractions, history of construction, Museo del Teatro (Theatre Museum), La Scala Ballet School, feast day of Sant'Ambrogio, collection of sculptures, paintings and ceramics, location and address details, Piazza della Scala, tel / telephone number, general tourist information about Teatro alla Scala (Milan Opera House) in Milan (Milano) area, Italy (Italia) IT - Last updated 30/10/2012. 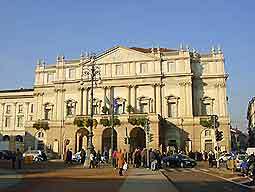 The Teatro alla Scala (Milan Opera House) dates back to 1776, when it was first constructed by Giuseppe Piermarini. Standing on the central site of Santa Maria della Scala, an old church that was built in 1381, Milan's Teatro alla Scala (Milan Opera House) was badly bombed during World War II and was completely rebuilt three years later. Attractions at the Teatro alla Scala (Milan Opera House) include the Museo del Teatro (Theatre Museum) which was created in 1913 and houses a fine collection of sculptures, paintings and ceramics, and also La Scala's Ballet School - founded in 1813 and responsible for producing many famous Italian ballerinas. The traditional opening night of the opera season in Milan takes place on the 7th December, on the feast day of Sant'Ambrogio, the patron saint of Milan.